"Business Intelligence derived Information and analysis"
Business Intelligence derived Information and analysis can lead to a tremendous return on investment (ROI) if implemented correctly. You can improve the decision making processes at all levels of management and improve your tactical and strategic management processes with it. Do you have quick access to actionable data? Would you like to increase collaboration and unlock insights from your business systems? What is Business Intelligence and why do organizations need it? 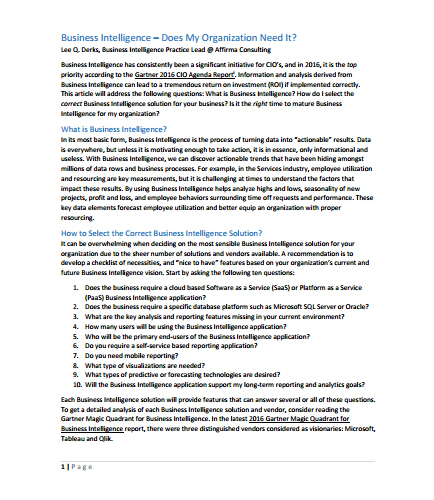 Is it the right time to implement Business Intelligence for your organization? How to select the correct Business Intelligence solution for your business needs? Enterprise Resource Planning (ERP) is a group of activities that help industries to manage its business. ERP control the flow of information within the organization, so that the enterprise decision can be data driven. The main goal of ERP software is to collect and organize data from various level of organization to provide the management with clear picture of organization data flow. What is Big Data analytics ?